28 November 1894 The school had to be closed from the middle of November - serious floods had rendered the school unfit for use and the roads had become impassable. 20 November 1899 Visit of the German Emperor to Windsor: the school was given a half day holiday. 4 February 1901 Queen Victoria’s burial at Frogmore was made public and so a half day holiday was given. 1 June 1901 A half day holiday was given as Peace was declared (following the Boer War). 30 September 1903 School was taken over by Buckinghamshire County Council. 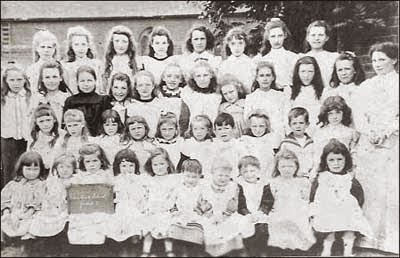 20 October 1905 The H.M. School Inspectors report that the school room is not fit to receive 85 children in one crowd. 2 April 1914 H.M. Inspector found that the air in the Infants room had become "vitiated" (of impaired quality). 5 September 1914 The school's long desks were replaced by the Education Committee with fifteen dual desks. 11 March 1920 Armistice Day was observed with 2 minutes silence. Sir Douglas Haig’s message was read, followed by the singing of ‘O God Our Help in Ages Past’. 3 September 1939 War declared against Germany (World War II).